during our stay in some places. Does any city or town is so significant to you in this respect? I was born and brought up in Delhi, so Delhi hold importance for me more than any city. My childhood was spent here, so I can relate to the city and its magnificent culture and people. I have plans to visit in July Deepak on my way to Kulu Manali. You are most welcome Bala! Nice to know that you do have a great time there. It is my pleasure Little Owl.I will speak to you soon. Hey balasri! I went to Canada a number of times and I will never forget any of the trips there! I totally fell in love with it each time! I saw so many beautful sites and really thought that one day I would really think about living there! It is such a beautiful and clean Country! Nothing like the USA! Every time I went back I fell in love all over again! And each city that I saw I had the same feeling! There just was something so special there! I haven't been back to Canada in quite a few years now, but I still would love to go back there and possibly would think about moving there some day! And now that I have some mylot friends there I have an even better reason! Even I have been told by friends that Canada is clean, calm and a city of good people. Sorry with cities of good people. i had been to tamilnadu recently for some work.i had reservations of the local people there,but i was very much surprised when i actually came in contact with them,they were very co-operative and caring,one person(a stranger(female))offered me and my hubby a place in their home to stay. That makes me very proud.We Tamilians are always original and never pretentious basically. My favourite cities are Amsterdam and Prague. I can't think of specific unforgettable experiences that I've had in either of them, though I've had a wonderful time in both. Perhaps I could should say that my entire time spent in those cities was unforgettable. Nice to know that you had a wonderful time there.I am happy that I am able to bring back those sweet memories of yours. I did some travelling when I was younger and I had great experiences in many places but the most memorable would have to be in Thailand on Koh Phi Phi. We were backpacking all over the place getting work whenever we could and we stayed in Thailand for about eight weeks mostly in Koh Phi Phi in a hut on the beach. It was a wonderful peaceful time of simple living and yummy food. The night entertainment consisted of choosing a film at a restaurant and watching the movie, that was it and it was fun. We met great people and the locals took us out on a boat to a nearby island where we caught our own fish cooked and ate it, which is something I never thought I would do; great experience! Wow! Sounds like a wonderful experinece and beautiful days.Well I too visited Thailand thrice and I like that place.Beautiful people and a great place for everything. Niagra Falls, the power, the roar, beauty, mist, awesomeness. I can agree to that.Only a few places have such beauty in the world. Have a great stay friend. Well, to me Miami,Florida has a great meaning because my family and friends are all there. I misss all the cuban food and all the cuban bakeries. To me, Miami is like a little bit of Cuba. I know.My business partner used to tell a lot about Miami and it's culture. There is a special place in the UK for me which has great significance because it was the first place I bought a house with my partner, sadly we split and my partner bought me out but I did have just over a year in the home, it was a dream home and I can still picture it now, it was a safe and warm neighbourhood and a place I felt comfortable in, we only went there by chance because we had friends living there who had invited us over for a meal one day, they took us around the place and we both fell in love with it. I must put old ghosts to rest and revisit the place one day, but I fear that I will bump into my ex, and that is something I do not relish with happiness! Reason enough to make this place unforgettable.We all have a special attachment to a single place in our life.I still cherish the small town Hatton in Sri Lanka among the tea estates I grew up.We came back to India 25 years back and I never had a chance to visit my childhood town No other place is etched so deeply in my mind. 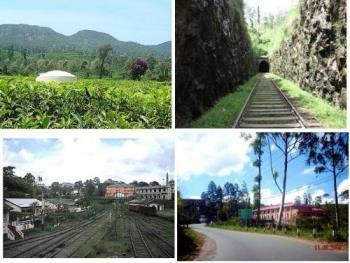 I have uploaded some images of that beautiful town friend. It is really an unforgettable experience reading your response. Vigan City is so significant to me. I can't forget this place. This excerpt recounts my good experiences at Vigan. I have it published at www.reviewstream.com/reviews/?p=59141 "I can never, ever forget my memorable visit to Vigan City,a place in Ilocos Sur, found at the Northern part of the Philippines, about 408 kilometers from Manila. This is the only place in the Philippines that has successfully preserved its Spanish colonial atmosphere all through the long years............ We wanted to feel Vigan and so we went walking along the bricked road to feel the distant past. We walked the narrow streets of the old Mestizo District, I got so impressed with the old bricks that lined the road, I was convinced that those bricks is one of the distinctive marks of the place. As I walked, we saw reminiscent of the old Spanish time I only knew from my History subjects in school and from the books of Dr. Jose Rizal. The sight of the well preserved old structures, the antiquated houses, paved narrow streets, horse-driven native carriages called calesas gave me a feel of how it were way back the old 19th century scene which I never really experienced as I was not yet born then.......So we walked along the antiquated roads to choose where to get a good dining experience. I got enticed with the Empanadas in one eating nook at Calle Crisologo and there we got a real taste of the culinary pride of the place. The crispy empanada, a delicacy of deep fried dough made from rice flour filled inside with green papaya and longganisa meat, topped egg dipped in cane vinegar tasted great and the rice cakes tasted great too.......It was so hard for us to leave the place especially with the thought that we still have yet to see the other wonderful tourist’s attractions there. But as the time to go came, we had no recourse but to say goodbye to that historic town with a promise to go back again." So this explains why this place called Vigan City is unforgettable to me!